This product was added to our database on Monday 18 December 2017. Based on forty years of detailed research, the Phoenix Project is a unique history of the wartime German Luftwaffe. Going far beyond a simple description of famous air battles and operations the overall work draws extensively on original documents, secondary sources and contemporary accounts to place the Luftwaffe within its proper historical context, gather together its many disparate components and provide a hitherto unpublished balance to its diverse activities. In addition to the lead role of the combat air forces the history provides a proper emphasis to the largely unsung work of the Anti-Aircraft Artillery, Luftwaffe ground forces, Signals Service and the Medical Services. It also examines in detail the vital work of the huge training organisation and the organisation and role of a continent-wide ground organisation. All theatres are covered thus placing a much needed emphasis on the Luftwaffe’s momentous struggle in the East, a theatre of operations that was always more urgent and more vital to the Wehrmacht. Throughout this work Luftwaffe activities are set within the wider role of overall military operations and Luftwaffe activity is therefore placed back within its proper context in the overall European conflict. 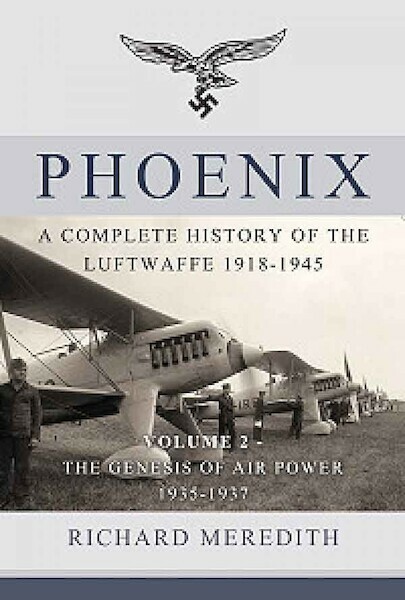 Volume 1: The Phoenix Reborn covers a particularly neglected area, specifically the post-war Reichswehr and the years of secrecy leading up to the unveiling of the Luftwaffe in 1935. Much of the key developmental work was completed at this time and the first volume examines the evolution of the uniquely German concept of operativer Luftkrieg, the work of the clandestine air staff and the key roles played by the German Transport Ministry and the Flight Centre Lipetsk in the technical development of military aircraft and the training of military aviators. It shows how Goring and Hitler essentially inherited an air arm in waiting – a product of covert military professional endeavour over a period of fifteen years. The structure of the Phoenix Project is totally unique. Five major themes run throughout the history’s constituent volumes – (A) Strategy and Command, (B) Ministerial Activity, (C) Technology and Production, (D) Infrastructure and Training, and (E) Operations. These divisions enable the reader to pursue particular areas of interest throughout the overall work or to look at the inter-relationships between the various aspects of Luftwaffe activity.